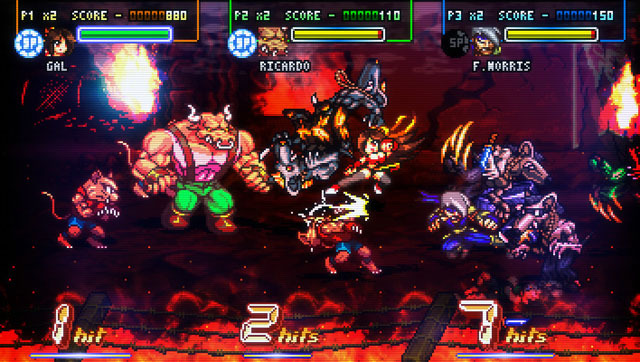 Fight‘N Rage, from Seba Games Dev, is a sidescrolling beat 'em up inspired by the classic brawlers of the arcade and 16-bit era, including Final Fight and Streets of Rage. On a future Earth where mutant animals have enslaved mankind, you play as a group of rebels attempting to save humanity. Players can go it alone or team up for local 2P or 3P combat, and racking up big combos and high scores allows for the purchase of numerous upgrades and add-ons. The game has a very simple control scheme but an incredible amount of versatility, with special attacks that can be used in a variety of ways, combos that can be interrupted or transitioned into throws or special attacks, and a huge array of moves for each fighter. The game also offers branching paths leading to different story elements and multiple endings. Where most indie games fall short when it comes to the beat 'em up experience, Fight 'N Rage offers an authentic classic brawler experience that is engaging from beginning to end. The game is available for PC via Steam. Check our coverage here.